Old stone property dating back to the 18th Century, with a main building and an outbuilding with a total area of around 600 sq. m., holding up to 20 persons with 5 double bedrooms, 4 singles. Old stone property dating back to the 18th Century, with a main building and an outbuilding with a total area of around 600 sq. m., holding up to 20 persons with 5 double bedrooms, 4 singles, 2 double sofa beds, a double bed in a loft, and 6 bathrooms. The swimming pool is fenced and heated and you can also enjoy wide open grassy areas with children’s games, a furnished veranda with barbecue and ping pong table, WiFi, air conditioning, heating, bicycles and covered parking. It’s an ideal property for large families or groups of friends searching for a quiet area whilst still being close to the town centre. The house is immersed in nature and has a well-kept, large garden with plants, flowers and lawn with children’s games, a small football field, a volleyball field, badminton, a trampoline and a archery field. The pool is 5 metres by 12 with a depth of 1.8 metres, in an ideal location between the villa and the outbuilding, fenced for the safety of children and warmed in the colder months. The pool is surrounded by a paved bathing area complete with beach chairs, umbrellas and a shower. There is also a corner where you can find a gazebo with a wooden table and chairs for sunset appetizers. Guests can also have outdoor lunches and barbecues in the large veranda with a table and chairs for every guests, a gas barbecue, ping pong table and dartboard. Just outside the property is a parking area, with 4 large, covered spaces and many more (not covered). The farmhouse, made of two buildings, was restored and renovated creating an outbuilding and 5 suites in the main villa, one inhabited by the owner. Each suite has a separate entrance. The ground floor living room, originally the stable, creates a medieval atmosphere around the fireplace, with a large 24-place wooden table and a perfectly equipped kitchen. This room is ideal for eating all together or for playing pool, for cookery courses or musical moments, with the hi-fi system and grand piano. This living room leads to all the outdoor areas, as well as to all the ground floor and first floor suites. The first suite on the ground floor has a double sofa bed and cooking area as well as a double bedroom with bathroom with shower. The second ground floor suite has a room with two single beds, a dining room with cooking area, a double bed and a bathroom with shower. Both ground floor suites have outdoor access. The first floor is reached via an indoor staircase. Here you will find two more suites (as well the owner’s suite). Suite 1: living/dining room with double sofa bed and small kitchen, a double bedroom, a bathroom with Jacuzzi and shower. Suite 2: living/dining room, cooking closet for making breakfast, 1 double bedroom and a bathroom with bathtub with massaging jets. There is a washing room next to this suite. The outbuilding is a few metres from the main building and is on two floors plus a loft. The entrance is near the outdoor terrace area for outdoor breakfasts, which leads to the dining room with a well-equipped kitchen area. The living room is very bright and complete with sofas and armchairs. A charming wrought-iron spiral staircase leads to the loft with double bed and access to the furnished terrace which overlooks the pool and the surrounding hills. Four steps lead down to an area with a large bathroom with shower and, four more steps below, there is a large double bedroom with bathroom with shower and access to the garden which leads to the swimming pool. Casale San Martino is a large property, part of a wealthy farm measuring over 700 acres by the river Arbia south of Siena. The villa is surrounded by fields and is immersed in nature, whilst being easy to reach from the famous Cassia road. The nearby town allows you to spend your holiday in contact with the locals. The farmhouse has WiFi, a Hifi system, central heating, air conditioning, a heated swimming pool, 5 bikes, children’s toys, high chair and parking just outside the property. The price includes bathroom, bedroom and kitchen linen along with swimming towels (changed weekly), internet, electricity, water, gas, heating, air conditioning, final cleaning, bikes, breakfast and 4 hours of hired help (for recycling and washing service) every working day, baby bed, high chair. Upon request and to be paid for at the house are cookery, drawing and ceramics classes, dinners, extra hired help, washing services and baby sitter. The pool is open from May 15th to October 15th. The washing room is used only by the hired help, to be paid for. The owner lives in one of the upstairs suites and sometimes uses the pool. 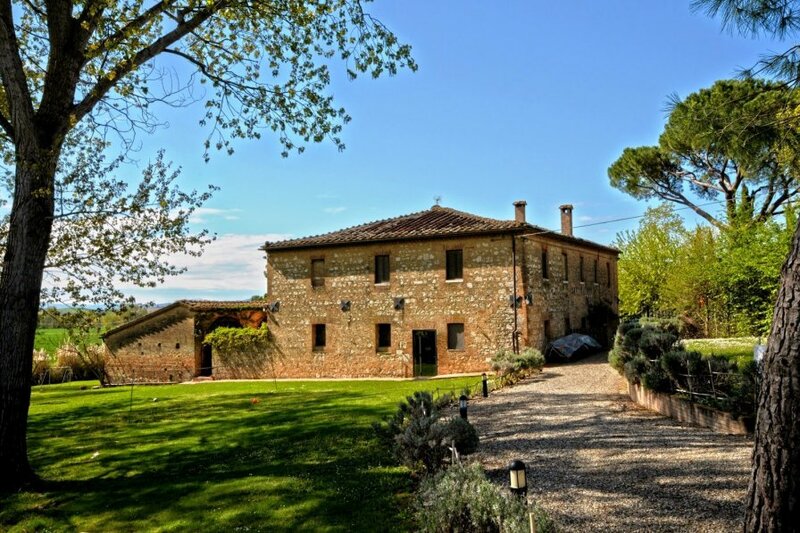 The property is great for groups of friends or families who don’t want to be too isolated and wish to explore the local dishes, conversations and Tuscan wine. It’s a perfect starting point for bike trips, in the trail around Monteroni d’Arbia and not far from horse riding areas, tennis fields and golf course. 1 km Monteroni d’Arbia (groceries and market), 12 km Siena, 56 km San Gimignano, 70 km Volterra, 87 km Florence, 100 km Arezzo, 150 km Pisa, 250 km Roma.